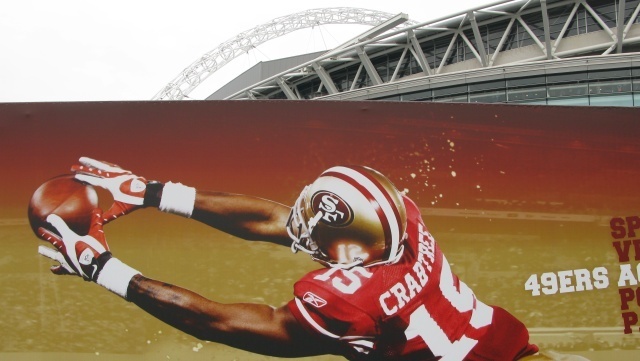 Ever since the San Francisco 49ers' plane touched down in London they've been looking to the running game as the most likely route to victory against the air tattoo of the Denver Broncos. 118 yards from star man Frank Gore on 29 carries and crowned by the winning touchdown underpinned their 24-16 triumph at Wembley Stadium last night, but it was a daring lofted pass that snatched the prize and a valiant rearguard action that held onto it. The pregame entertainment was perhaps the best for the NFL at Wembley so far with San Francisco's own cheerleaders and marching drummers accompanying a spirited, if ear-splitting, My Chemical Romance and the anthems taken care of capably by Grammy award winner Michelle Williams (US, on loan from Strictly Come Dancing) and the evergreen Jeff Beck (UK, providing a jazz-baroque alternative to Brian May). The two teams, both arriving with significant losing records, spent the whole first half sizing each other up while trying not to let the game get away from them. Half time saw the 49ers with their noses in front courtesy of Joe Nedney's field goal, but left a crowd who were playing the role of home fans even better than in previous years with little more to spark them. Indeed, after half-time it was Denver, enthusiastically harangued throughout, who responded with a long completion to Brandon Lloyd and a power touchdown courtesy of this year's top jersey seller, Tim Tebow. Nedney failed with another field goal attempt, but San Francisco's leaders let it be known they would not take this lying down. Manny Lawson, apparently miffed that he fell foul of the NFL's recent concussion jitters when brushing Denver quarterback Kyle Orton's helmet responded by nailing him to the deck with a fearsome, if legal, challenge while his own QB, surprise starter Troy Smith, barely acquainted with his new colleagues, showed them his mettle by first dragging the veteran Gore like an errant kitten to his proper starting position and then putting a stunning hit into a startled Bronco that rescued Gore from a hole. Even so, it was Denver who finished the third quarter with a virtuoso fleaflicker "trick play" that had even the partizan crowd applauding warmly until it was called back for a clear blocking misdemeanour. Denver opened the final quarter with a field goal to go 10-3 up, but then the moment came that galvanised the 49ers' night, and perhaps their season, as Smith, rolling out right to evade pressure and finally felled, took a huge risk flinging the ball high into the night sky towards the goalline where legendary Broncos defenders Brian Dawkins and Champ Bailey seemed destined to catch it. 49ers tight end Delanie Walker was waiting between them. It kind of shocked me a little bit, but when he threw it I knew he had confidence in me, so I had to make the play. Dawkins jumped a little early and gave me enough time to make the adjustment on the ball. Moments later Smith unveiled more surprises by bringing the scores level on a daring dash for the corner. Denver, suddenly on the back foot themselves, surrendered the ball quickly and Smith found star prospect Michael Crabtree losing his marker for another score. Then Orton set off on an ill-advised run and his nemesis Lawson slapped the ball away from him to set up Gore's touchdown. 24-10 with three and a half minutes left looked straightforward to manage, but Denver have a lot of fight and San Francisco aren't used to winning. The Orton-Lloyd connection created another drive and touchdown, this time with a beautifully thrown pass that 49ers defender Will James simply couldn't reach. Amazingly, kicker Matt Prater scuffed the extra point, causing San Francisco to set up for an onside kick that didn't come leaving their bemused returner Ted Ginn to slide to safety in the absence of blockers. Moments later everything looked to be back on the line as Eddie Royal took a Denver punt return to the house only for a crude penalty to take play back to their own end. Orton now had a long way to go in little time, James all but captured another pass zinged to Lloyd and finally the game was up when defender Shawntae Spencer realised Orton was throwing his way, stopped, turned round and gleefully pouched the ball. On this evidence, both teams deserve better than their poor records suggest. Relieved euphoria understandably permeated the post- match atmosphere amongst the 49ers and, if Wembley victors the New York Giants and the New Orleans Saints are anything to go by, this could be the start of something big.